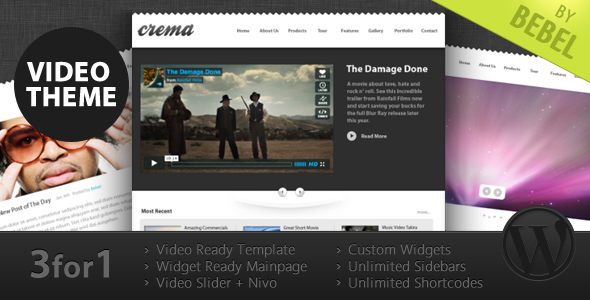 Crema is a video ready, multifunctional and rich featured template. The widgetized mainpage let’s you populate the frontpage however you like. Use our custom widgets to create a video, blog or business page! Create a slider within a post – no code required: we created a special post options panel that shows up underneath each post where you can create the slides. In every post you create you can add custom SEO information. Now that’s a feature, isn’t it! Video gallery included! Its as simple (or even simpler) as creating a blog post. All from the backend. No coding required! PLUS Rating system for each video PLUS Comment system for each video PLUS Related videos. Next to each video you’ll find more related videos. Three amazing widgets to show off your video gallery! If you install the shipped plugins, you can include videos from over 30 different video sites! Don’t worry about the hassle of searching for the embed code. Simply copy & paste the URL to the video! Self hosted videos are allowed and possible! Supports wordpress tags – and shows a neat tag cloud beneath every video! Show of products or a website portfolio with this incredible feature. Our previous clients love this feature: Populate the mainpage by just dragging and dropping widgets in the mainpage widget area! We deliver 8 custom widgets that make it possible for you to create your own page! Don’t be limited by one widgetized page. Create as many as you want! Create as many custom sidebars as you want! All through the backend menu – no coding required. With our sidebar widget, you have full control over the sidebars. Split the frontpage into two widget sections and populate them easily with widgets. Use them for widgetized pages, just like the main page! Our shortcodes make it easy to stand out! The custom code snippets let you create some nice layout details with a short line of code! And the best: We bring you buttons in the html editor and some in the WYSIWYG that automatically create the code for the shortcodes and paste them into the textfield. We created a system that allows you to create your own shortcodes No coding required! Ideal for ad-shortcodes or recurring text elements! We created a variety of incredible useful widgets for you to choose from. Take a look at the preview to see what Crema has to offer! 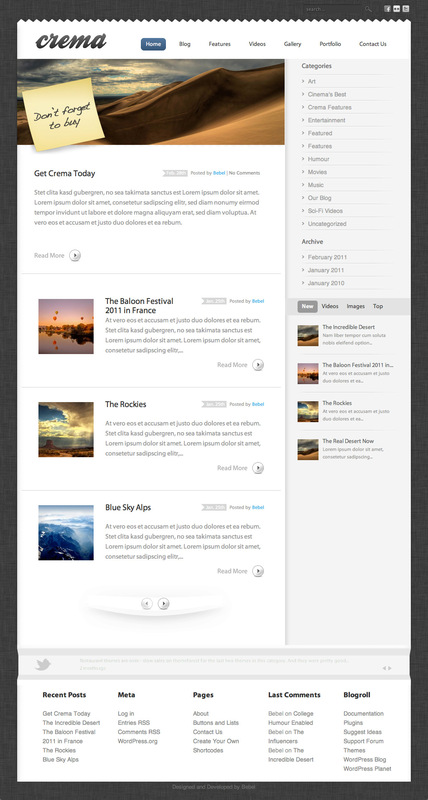 The widgets are waiting for you in the widget area of the wordpress backend. If you hide it, the post will take the full side width! Perfect if you need more space to advertise your products! The help file comes as a standalone html and built in into your wordpress backend! Never worry about getting help if you don’t work from your PC! What is better than a moving picture when it comes to learn something? We created some quick videocasts to show you how to setup and get started with Crema. simply translate it to your language !http://thebebel.com/themeforest/promo/help.png!